The Indian Equity Markets took a breather on the anticipated lines as it severely consolidated in a much capped range on Wednesday and traded without any directional bias. The benchmark Index NIFTY50 spent the entire session in a much capped ranged and ended the day on a flat note gaining just 2.30 points or 0.02%. Going into trade on Thursday, we enter the expiry day of the current derivative series. We expect a flat start but expect good amount of volatility owing to rollover. Despite some stock specific out-performances, we expect the Markets to face very stiff resistance at current levels. There are heightened chances that the Markets may witness some corrective activity at higher levels with limited downsides. 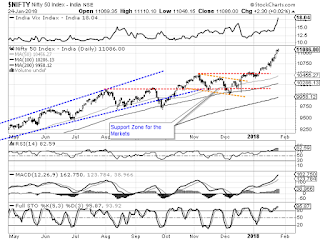 The levels of 11105 and 11165 will continue to play out as immediate resistance to the Markets. Supports come in much lower at 10955 and 10910 zones. The Relative Strength Index – RSI on the Daily Chart is 82.5918 and though it has went on to mark a fresh 14-period high which is bullish, it trades in highly overbought territory. The Daily MACD is bullish while trading above its signal line. No significant formations were seen on Candles. 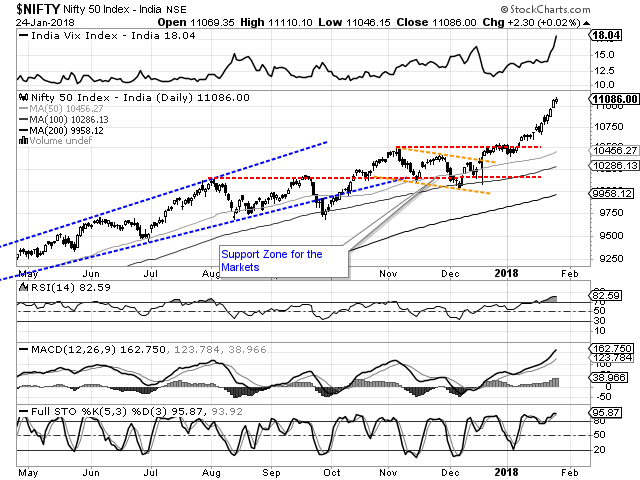 The pattern analysis shows that after breakout out above the 10490-mark, the NIFTY has achieved the levels which are higher than the otherwise expected measured implications. Though this shows uptrend firmly in place, we cannot ignore few technical inputs which point towards the Markets slipping into some short term consolidation. Despite the current uptrend remaining firmly in place, we cannot ignore the extremely overbought nature of the lead indicators on the Daily Charts. The NIFTY PCR (Put-to-Call Ratio) currently stands near 1.90 which is highly overbought. Also, the India VIX (Volatility Index) is at its fresh high and rose nearly 11.19% while the Markets ended flat. All these point towards consolidation in a broad range starting anytime soon. Though the downsides may be limited, but volatile oscillations in the Markets cannot be ruled out. We recommend keeping exposures very light and adopting highly cautious view on the Markets.